THE Number of those maintain'd in the Workhouse here is seventeen, viz. 8 old, and 9 young, almost all of them unable to do any Work for their Livelihood, except three Boys, Who are emp1oy'd in working for Weavers, which brings in about 4s. per Week. As to the Subsistence of the Poor, the Inhabitants have agreed, that each of them will take it by Turns, one, one Week, and another, another, to buy in Provision. Their Expence now, only amounts to 100l. per Annum; whereas before it was above 170l. They allow a Man 2s. 6d. a Week to keep, them in good Order, to cut their Victuals, and to teach the Children to read. IT is not yet two Years since it was first begun and was design'd chiefly to lessen the Poor's Levies; which were grown very great, and were likely to increase, and in Reference to this, it has already had a very good Effect, and it is hoped in time it will turn to a much better Account. The Number of Poor was great, that is, of idle People, who desired Collection, and, if refused it, would make their Complaint to a Justice of the Peace, and sometimes get an Order, or Warrant, some for two Shillings, some three Shilling, some for four Shillings per Week, with which the Parish was exceedingly perplexed, and were thereby put upon setting up the Workhouse; nor are they now pester'd with the Poor, as they were wont to be: For if they come to the Officers for Collection they take them into the Workhouse, and employ those that are able, and keep them to Work. Those that are decrepid, or decay's by old Age, or any ways unable, they maintain. THE house is a well-contriv'd Building, in Form of a Court four-square, with several Apartments for lodging, and other Conveniencies. There is a Hall, or long Room, with Tables and Benches, where they have their set Meals, and where afterwards they may spin; and in Summer the young Boys or Girls may spin in the Court. They have laid in a Provision of several Cheeses, and of Coals, for which they have convenient Places. At present as far as I can perceive, it may be called rather an Almshouse, than a Workhouse; those who are able to work do not care to come into it, because of the Confinement to which they must then be subject: For it is an Order of the House, not to suffer those who come into it for Maintenance, or for Work, to go out, or to ramble abroad to beg, as they us'd to do. They are kept close to their Work and Business, which is the Reason why they have so few in the House, notwithstanding they are so well provided for with Necessaries. For they give no Collection now to any, as they did formerly. They have taken upon them to provide either Maintenance or Work for their Poor, viz. such of them as want Work. But there is little Danger of that. For poor People are now generally got into the Way of spinning jersey, which turns to a good Account, for they can have ready Money for their Work, and some earn at least 6d. per Day, if they can spin well, and are diligent at it. A parliamentary report of 1777 recorded parish workhouses in operation at Harborough (for up to 30 inmates), Bowden Magna [Great Bowden] (20), Foxton (12), Lubbenham (20), Smeeton Westerby (20), Clipston (20), Great Oxendon (15), and Wilbarston (30). Like many parish workhouses, Harborough's was "farmed" by a contractor. In 1793, Joseph Tilley was paid four guineas a week to become master of the workhouse, and to cover all its expenses. His duties included teaching the workhouse children to read. The following year, the contract was renewed at five guineas per week. In 1796-7, payment was based on a formula of 2s.6d per inmate per week at a time when there were generally between 15 and 20 in residence. The payments system reverted to a flat fee of £6 per week in 1798-9. Work done by the inmates included spinning and knitting. The workhouse was rebuilt in around 1801. Pre-1800 workhouses also existed at Bosworth, Cranoe and Shangton. In 1803, Laughton erected a parish workhouse at a cost of £117. 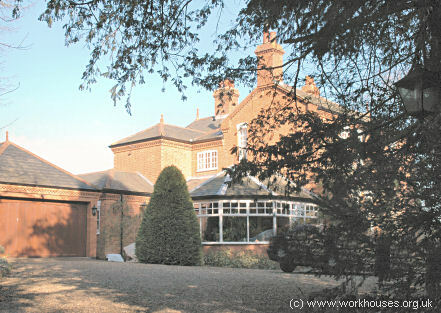 By the 1830s, Mowsley had a workhouse located at the eastern end of The Nook. County of Leicester: Bowden Magna [Great Bowden], Cranoe, Fleckney, Foxton, Glooston, Gumley, Husbands Bosworth, Kibworth Beauchamp, Kibworth Harcourt, East Langton, West Langton, Thorp [Thorpe] Langton, Tur Langton, Laughton, Lubbenham [Lubenham], Market Harborough (2), Mowsley, Saddington, Shangton, Smeeton Westerby, Stonton Wyville, Theddingworth, Welham. County of Northampton: Stoke Albany, Arthingworth, Ashley, Sutton Bassett, Little Bowden, Brampton, Braybrooke, Clipston, Dingley, East Farndon, Oxenden Magna [Great Oxendon], Hotthorpe [Hothorpe], Kelmarsh, Sibbertoft, Sulby, Marston Trussel, Weston by Welland, Wilbarston. Later Additions: Slawston (from 1895), Thorpe Lubenham (from 1863), Welford (from 1897). The population falling within the union at the 1831 census had been 14,757 with parishes ranging in size from Hothorpe (population 26) to Market Harborough itself (2,272). The average annual poor-rate expenditure for the period 1833-5 had been £14,677 or 19s.11d. per head of the population. 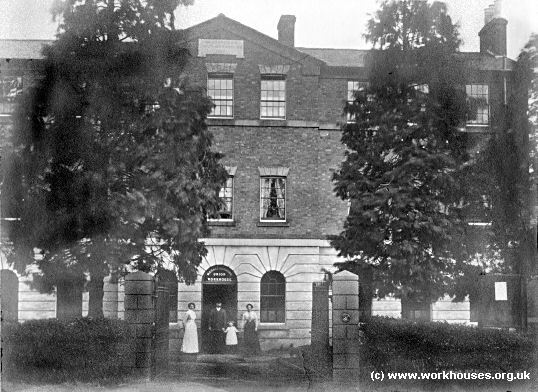 Market Harborough workhouse site, 1899. Market Harborough was based on Kempthorne's model "square" design published by the Poor Law Commissioners in 1835. A three-storey entrance block at the south contained the porter's lodge, board-room and administrative offices. To the rear, four accommodation wings for different classes of inmate (male/female, old/able-bodied) radiated from a central supervisory hub. The areas between the wings formed segregated exercise yards. Some expansion took place at the north of the site in the early twentieth century including a new infirmary. 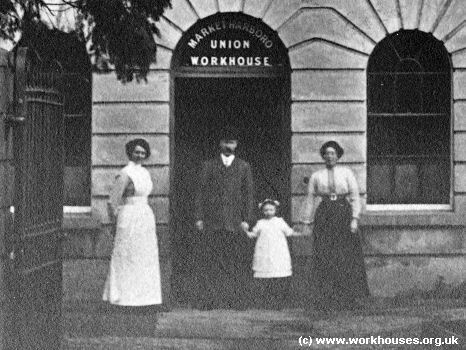 Market Harborough workhouse entrance, c.1900. 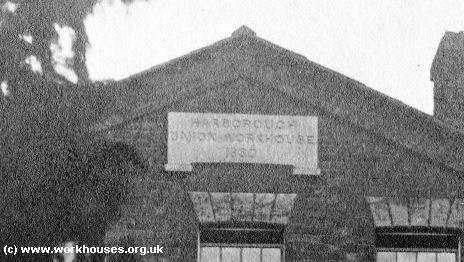 Market Harborough workhouse entrance (detail), c.1900. The site later became St Luke's Hospital. The old workhouse buildings have now been demolished with the exception of a small derelict block at the south-west of the site. Market Harborough site from the south-west, 2000. Later infirmary buildings at the north in site are still in use. 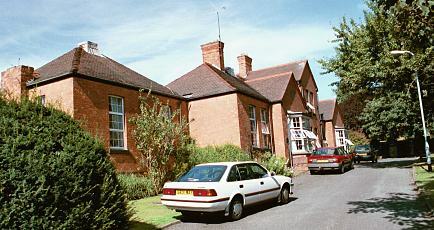 Market Harborough infirmary block from the south-east, 2000. In 1912, the union set up a cottage home in a leased house known as 'The Mount' on Back Lane in East Farndon. The home provided accommodation for pauper children away from the workhouse in a rural environment. In 1930, the home was taken over by Northamptonshire County Council and continued in use as a children's home until 1953. It is now a private house known as "The Limes". East Farndon former cottage home, 2007. The Record Office for Leicestershire, Leicester and Rutland, Long Street, Wigston Magna, Leicester, LE18 2AH. Holdings include: Guardians' minutes (1835-1930); Births (1837-1914); Deaths (1837-1948); Creed register (1891-1949); Punishment book (1914-38); Admissions and discharges (1903-49); Porter's admission and discharge books (1908-48).